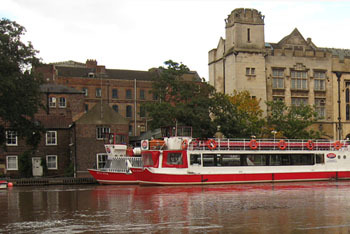 I wasn’t going to mention the recent suggestions for redevelopment of part of the riverside near the Guildhall, as it seems to have been well-covered on several local websites and in The Press. And this isn’t a planning application we’re talking about, it was only a competition designed to encourage ideas. And I wasn’t sure I could deal with yet another manifestation of this recurring urge to gentrify the life out of every bit of the city centre. I did call in to the library to have a look at the ideas/plans on display, but didn’t have enough time to fully absorb and consider the information, and meant to call back. The exhibition was only in York Explore, and only for three days, and I wasn’t able to get back there in time. I imagine 99% of York’s population didn’t get to see the display either. The display included the thinking behind the schemes, the approach taken, that kind of thing. None of that information was easily available online. Promoted online were five rather small and inadequate drawings of the proposals. One was from a completely different viewpoint to the others. How anyone made a judgement on the basis of that I don’t know. The brief display took place during another flood, which as always caused traffic problems, and so it’s even more unlikely that people would be rushing into the city centre from out in Acomb and Fulford, grappling with the choked-up roads, to view the plans in the library. But I get the impression, increasingly, that the opinion of the ordinary residents who live in the suburbs doesn’t matter anyway. Though everyone’s been talking about this as affecting the Guildhall site, it’s the adjoining boatyard site the new buildings would occupy. Many of us have probably never paid much attention to the boatyard, as it’s a humble kind of place. From Lendal Bridge and from the opposite bank it’s just a collection of red brick buildings and boatyard bits, just weathered and small and not making any kind of statement except perhaps of a natural evolution, of a working place, settled and quietly charming. And, crucially, it has greenery, trees. It used to have a few more, but they seem to have been removed. Still, it enhances its neighbours, with its retreating red brick and softening green. 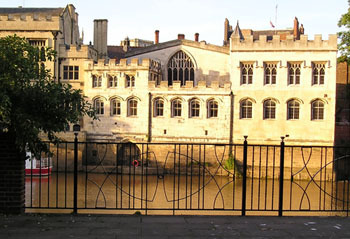 It doesn’t compete with the Guildhall buildings in their beautiful light-reflecting stone, rising out of the water. 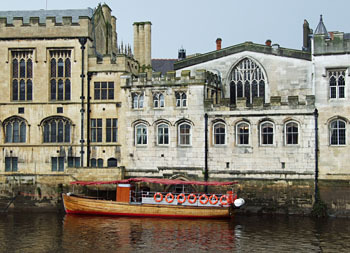 The boatyard area sits back, a foil to the Guildhall on one side and bright shiny Lendal Bridge on the other. In the middle of it is an 18th century ‘vernacular’ building. The riverside walkway idea has of course come up again. I know the Esher report of the 1960s was keen on the idea of some kind of walkway right along here, but hadn’t realised that the idea goes right back to a 1948 plan. The city’s planners seem to have been fixated on this idea for decades on end. What are we going to stand and admire from the walkway here – the Aviva building or the big ugly Park Inn? In my rather rushed reading of the background information on the display boards I noticed that one of the plans made a point of not including a walkway, specifically because it would ruin the front of the Guildhall to have a horizontal structure across it. They’re right, aren’t they? I’ve looked at this glorious riverside scene many times over the years, in all weathers, at all times of the day. 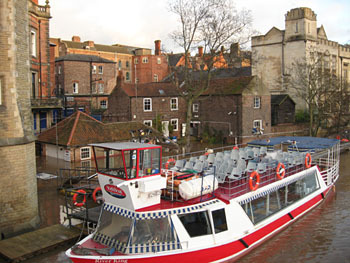 It wouldn’t be improved by having some kind of elevated walkway cutting across the the front of it. Look, just perfect, isn’t it, viewed from the opposite bank. On this opposite bank is a previous generation’s idea of ‘riverside access’. It’s not the most attractive space and should perhaps serve as a warning … ? – or if you’re too late, or would rather comment here, comments are welcome below. I discovered, via Googling, a lot of background information on the Guildhall and boatyard site on the RIBA website, in the information prepared for those entering the competition. See in particular the PDF files on this page if you’re interested in the history of the site and its buildings.